£10,000.00 seed money for script-in-hand readings / casting shoots at pre-production of new works. Ongoing Edition since November 2008. Editor - Louis P. Burns aka Lugh © All rights reserved. HIGH VELOCITY by Louis P. Burns aka Lugh © 2001 / 2006. All rights reserved. HARD SHOULDER by Andy West and Mark Noe / 3rd Rock Revolution © 2007. All rights reserved and respected. Listen to the 3rd Rock Revolution interview and live acoustic set from March 2009 with Nick Fields of Pheonix FM. Upstate Renegade Productions extend a massive thanks to 3rd Rock Revolution and Steve Mead, Station Manager. BELIEVING THE VOICES by K J Lander © 2009. All rights reserved and respected. PUTTING THE RECORD STRAIGHT by Ack / Richard Hedley Atkinson © 2008. All rights reserved and respected. UNTITLED (Arabic and English) by Mehrez Aounallah © 2008. All rights reserved and respected. THE BLUEGREENEARTH EXPERIENCE An extensive interview with Tim Barton of BlueGreenEarth by Louis P. Burns aka Lugh © 2008. (This is a copyleft interview) Some rights reserved. BOOM HALL by Eamonn McGinty © 2008. All rights reserved and respected. THE BEATLES OR THE STONES? by Brian Gillespie © 2008. All rights reserved and respected. THE DARKER SIDE OF THE MORNING by Louis P. Burns aka Lugh © 2001. All Rights Reserved. Editor: Catherine Edmunds aka delph_ambi. A REQUIEM FOR ICARUS by Amanda Gillespie © 2008. All rights reserved and respected. THE CATHERINE EDMUNDS EXPERIENCE Louis P. Burns aka Lugh interviews artist, editor, illustrator, published poet, novelist and accomplished chamber musician; Catherine Edmunds aka delph_ambi. Interview by Louis P. Burns aka Lugh © 2008. All rights reserved. IN THE HUM - Music by Andy West aka Taxman & the Anti-Heroes © 2008. All rights reserved and respected. Poetry by Louis P. Burns aka Lugh © 2008. All rights reserved. COMMUNION Lyrics by Louis P. Burns aka Lugh. Music & vocals by Andy West - Famous Blue Raincoat © 1988/89. Flash animation - Microscopic Circles in the Fluid of my Sight, to run in synchronicity by Louis P. Burns aka Lugh animation by Diarmuid McGowan © 2004/2008. All rights of the artists reserved and respected. Additional literary editing by Mike Daniels aka danimik. DIRTY MUTANTS by Andy West (solo project work as) Taxman & the Anti-Heroes ©. All rights reserved and respected ^ Right click the Dirty Mutants title above and select open in a new window to listen to Dirty Mutants (Adult Content) while you browse the pages of Sensitize ©. CAMERA by Brian Gillespie © 2008. All rights reserved and respected. THE GADGETS MAN Comedy poem by Louis P. Burns aka Lugh © 2001. All rights reserved. Editor: Catherine Edmunds aka delph_ambi. YOU SISTER by Eamonn McGinty © 2008. All rights reserved and respected. VOICE OF THE CROWD Words and music by Louis P. Burns aka Lugh © 1987. Performed by Famous Blue Raincoat. Guitar Louis P. Burns aka Lugh. Vocals Andy West © 1987/2008. All rights reserved. LORICA BABYLONIAN by Louis P. Burns aka Lugh © 1992/2006. All Rights Reserved Catherine Edmunds aka delph_ambi worked as editor on many poems by Louis P. Burns aka Lugh (the owner of this site) here on the upstaterenegadeproductions.com domain, Lorica Babylonian is one such piece. To read a working demonstration of this process in action please click here. PUT ON YA BOOTS by Andy West and Mark Noe - 3rd Rock Revolution © 2007. All rights reserved and respected. Listen to the 3rd Rock Revolution interview and live acoustic set from March 2009 with Nick Fields of Pheonix FM. Upstate Renegade Productions extend a massive thanks to 3rd Rock Revolution and Steve Mead, Station Manager. RELEASE by Louis P. Burns aka Lugh © 2001 / 2006. All Rights Reserved. NUTTIN by Ack / Richard Hedley Atkinson © 2008. All rights reserved and respected. LAL (Hindi: Beloved) by Louis P. Burns aka Lugh © 1993 / 2006. All Rights Reserved. HEALING HERBS (a medical cannabis information film) by Louis P. Burns aka Lugh and Diarmuid McGowan as/for Upstate Renegade Productions © 2003/2008. All rights reserved. NON STARTER by Andy West and Mark Noe - 3rd Rock Revolution © 2007. All rights reserved and respected. Listen to the 3rd Rock Revolution interview and live acoustic set from March 2009 with Nick Fields of Pheonix FM. Upstate Renegade Productions extend a massive thanks to 3rd Rock Revolution and Steve Mead, Station Manager. ONE SUNDAY by Louis P. Burns aka Lugh © 2001. All Rights Reserved. Editor: Catherine Edmunds aka delph_ambi. EMPTY SPACE by Andy West and Mark Noe - 3rd Rock Revolution © 2007. All rights reserved and respected. Listen to the 3rd Rock Revolution interview and live acoustic set from March 2009 with Nick Fields of Pheonix FM. Upstate Renegade Productions extend a massive thanks to 3rd Rock Revolution and Steve Mead, Station Manager. HOWLING LAUGHTER IN THE NIGHT by Louis P. Burns aka Lugh © 2007. All Rights Reserved. CHRISTMAS STUFFING - A FOOD FIBONACCI by Louis P. Burns aka Lugh © 2006. All Rights Reserved. THE ARTIST WITH HER SLOWLY DYING FRIEND by Louis P. Burns aka Lugh © 2007. All rights reserved. Editors: Catherine Edmunds aka delph_ambi and Mike Daniels aka danimik. All content is the product of various collaborations between the artists, e-poets, filmakers, media/music producers, researchers and writers working with Louis P. Burns aka Lugh via the Sensitize © 18+ Adult Content community for activists, artists, e-poets, filmakers, media/music producers and writers forums or in realtime (past or present). Louis P. Burns aka Lugh (the owner of this wonderful website catering to activists, artists, e-poets, filmakers, musicians and writers) drinks loads of coffee, stays up 22 hours a day providing this service and believes in reinventing the art of busking for the digital age. Click the PayPal banner up above to buy the poor soul a coffee. if you're feeling extra generous buy him a doughnut as well. an online arts / film / media / music / multimedia poetry and writer's production and promotional publication service. Click Sensitize © banner above to return to main menu. 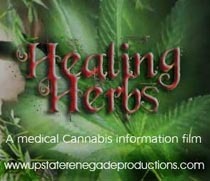 Our medical cannabis information film - HEALING HERBS commenced 2003 and is an ongoing production and publication. By clicking or double-clicking the BlueGreenEarth banner you will be taken off site to the bluegreenearth.com domain which is facilitated by Tim Barton and colleagues. Why not bookmark us in your favourites folder and visit us again? Upstate Renegade Productions adapted the above animated banner from an original by Tim Barton for Bluegreenearth (BGE). This was to say thanks for their assistance with the post production research of Healing Herbs. This is also to say thanks to Tim for taking time out of his heavy schedule to be interviewed for the Sensitize e-magazine. Click here to read the BlueGreenEarth Experience. THE BANKERS by GRAND HARMONIC - Special Guest Band on Sensitize ©. You can buy this single from: iTunes, eMusic, HMV,Ditto, Tesco Digital,Rhapsody, 7digital.Click here to view as larger video directly on YouTube. Or click here to read more about Grand Harmonic on their Sensitize © forum.